Overview Seizures are a common occurrence in children. 8% will have at least one seizure by 15 years of age. 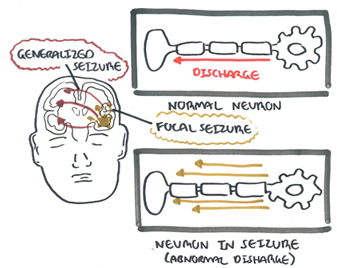 A seizure is the result of an abnormal paroxysmal discharge by cerebral neurons. Many underlying conditions and neurological challenges may provoke seizures, and in over 50% of children seizures are isolated events associated with either a fever (febrile seizures/convulsions) or minor head injury in early childhood. Seizure: sudden attack of altered behaviour, consciousness, sensation or autonomic function produced by a transient disruption of brain function. The result of this altered brain function is most commonly a tonic (stiffening) or tonic-clonic (stiffening-jerking) seizure. 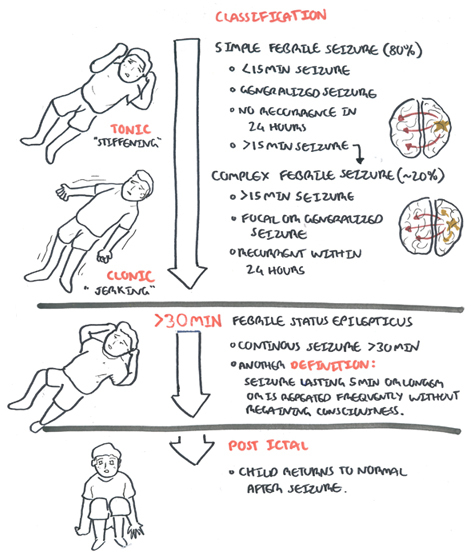 Epilepsy: common set of variable conditions with recurrent seizures. Presents when at least 2 unprovoked seizures occur >24 hours apart. Non Febrile convulsion (seizures): These are seizures occuring without presence of a fever. There are many causes one of which is epilepsy. Simple febrile seizures — Simple febrile seizures are generalized, last less than 15 minutes, and do not recur in a 24-hour period. The most common seizure type is generalized clonic, but atonic and tonic spells are also seen. Complex febrile seizures — Complex febrile seizures (focal onset, prolonged, or recurrent within 24 hours) are less prevalent, making up approximately 20 percent of febrile seizures in most series. 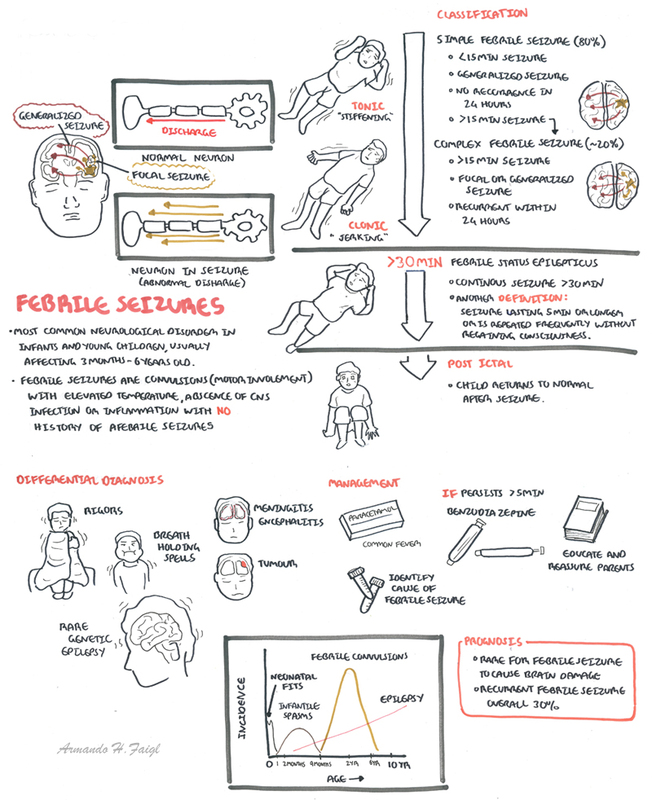 Febrile status epilepticus — Some patients present in febrile status epilepticus (FSE), ie, continuous seizures or intermittent seizures without neurologic recovery, lasting for a period of 30 minutes or longer. Remember In a simple febrile convulsion, where the focus of infection can be identified, blood tests and invasive investigations are often NOT indicated.